MONDAY, 5:08pm: The Raiders have officially released Helu with an injury settlement, according to Scott Bair of CSNBayArea.com. 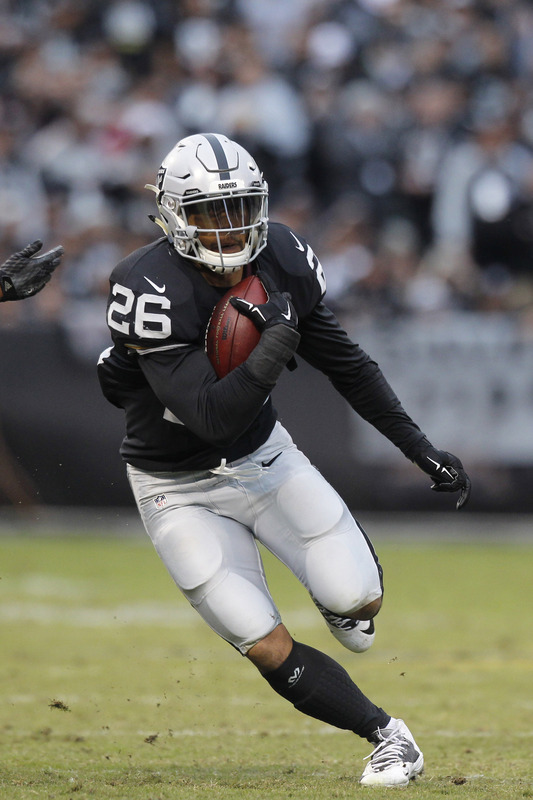 SUNDAY, 7:56pm: Helu will be out until midseason following hip surgeries, tweets Adam Caplan of ESPN.com, who confirms that the Raiders are still trying to work out an injury settlement. FRIDAY, 4:38pm: Oakland has not released Helu yet, according to Bair (Twitter link). The team instead placed him on injured reserve, but an injury settlement is likely on the way. 3:45pm: The Raiders have released Roy Helu, as Scott Bair of CSNBayArea.com tweets. The move will make room on the roster for defensive tackle Derrick Lott. The 27-year-old Helu rushed for only 216 yards in Washington in 2014, but was a focal point of the club’s passing attack, catching 42 balls for nearly 500 yards. He drew interest from several teams around the league last offseason, many of whom presumably wanted him to a fill their third-down back role. The Patriots, Jets, and Giants all pursued Helu, but he ultimately signed with Oakland. Unfortunately, he did not do enough for the Raiders to warrant them fulfilling the backend of his two-year, $4MM pact ($1MM fully guaranteed). In 2015, Helu rushed 17 times for 39 yards and added nine catches for 75 yards. Lott, a Chattanooga alum, was originally signed as an undrafted free agent by the Titans in 2015. After spending the entirety of last year bouncing on and off the Buccaneers’ practice squad, he agreed to terms with the Eagles in late May. A couple of weeks ago, however, Philly cut him loose. The Panthers have signed cornerback Leonard Johnson and waived fellow defensive back Shaq Richardson, the club announced today. The 26-year-old Johnson spent the first three seasons of his career with the Buccaneers before joining the Patriots in 2015, and has seen significant action at slot corner throughout his time in the NFL, accruing 20 starts between Tampa Bay and New England. Carolina signed nickel cornerback Brandon Boykin earlier this year, but released him after he spent only two months or so with the team, so the Panthers could use help at inside corner. Richardson, meanwhile, was selected by the Steelers in the fifth round of the 2014 draft, but has yet to appear in an NFL contest. The Eagles have waived defensive tackle Derrick Lott, according to Jeff McLane of the Philadelphia Inquirer (Twitter link). Lott, a Chattanooga alum, was originally signed as an undrafted free agent by the Titans in 2015. After spending the entirety of last year bouncing on and off the Buccaneers’ practice squad, he agreed to terms with the Eagles in late May. The Colts announced that they’ve signed second-round safety T.J. Green. Green, a Clemson product, was selected 57th overall in last month’s draft, and while he played safety in college, there’s been some chatter that he could be moved to corner in the NFL. The Vikings have signed defensive tackle Travis Raciti and waived running back Brandon Ross, Matt Vensel of the Star-Tribune tweets. Raciti spent his first NFL season in Philadelphia on the club’s practice squad. The former San Jose State Spartan played in 49 games (45 starts) as a defensive tackle and twice earned all-conference honors. The Eagles have signed defensive tackle Derrick Lott and released punter Ryan Quigley, as Jeff McLane of the Philadelphia Inquirer tweets. With Quigley out of the picture, it would appear that Donnie Jones has won the team’s punter job. Lott was on Tampa Bay’s taxi squad in 2015 and will try to make the cut in Philly. The Saints have waived long-snapper Chris Highland, who joined the team for his second stint earlier this month (Twitter link via Evan Woodbery of The Times Picayune). Panthers tight end Jake McGee has reverted to injured reserve after being waived-injured, Aaron Wilson of The Houston Chronicle tweets. McGee began his career at Virginia but, thanks to graduate transfer rules, was able to finish up at Florida. In what would have been his first year at UF, he broke his left leg and spent the year rehabbing instead of playing. Last year, McGee caught 41 passes for 381 yards and four touchdowns. The Panthers opened the 2016 league year with only two defensive tackles under contract, but have been active in adding depth at the position in recent weeks. The latest addition to the team’s defensive line is Robert Thomas, who was cut by the Dolphins on Thursday — Carolina claimed him off waivers today, per Pro Football Talk (Twitter link). Linebacker A.J. Tarpley, who announced earlier in April that he has decided to retire due to concussion concerns, was officially waived by the Bills today, along with tight end Jacob Maxwell, the team announced (via Twitter). At the start of the week, the Browns announced that they had signed wide receiver Saalim Hakim. However, Hakim’s stint in Cleveland was short-lived. As Darin Gantt of Pro Football Talk writes, the Browns cut Hakim from their roster today. Perhaps clearing room to add a few extra undrafted free agents at the conclusion of the draft, the Buccaneers announced today that they’ve waived eight players from their 90-man roster. The players receiving their walking papers are as follows: wide receiver Andre Davis, linebacker Darius Eubanks, guard Antoine Everett, safety Gerod Holliman, defensive tackle Derrick Lott, safety Kimario McFadden, linebacker Jermauria Rasco and cornerback C.J. Roberts. Now that the 2015 regular season is in the books, teams can begin signing players to reserve/futures contracts, adding those players to their 90-man offseason rosters. Generally, these players finished the season on a team’s practice squad, though some were free agents at season’s end.